Patrick may have aged, but that wasn’t going to keep him from doing what he loved. He was tracking down someone elusive for Clark Klein. At first, Patrick thought he was kidding… but when he explained the full idea, Patrick was inclined to accept for curiosity’s sake. Unfortunately, all he found at the cemetery were ghosts. This wasn’t a particularly stunning find, especially not compared to who he was seeking out for Clark. 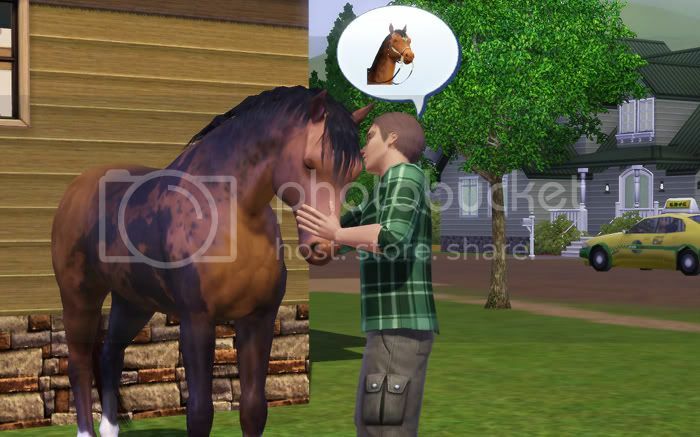 Mark helped Philip out with the horses, as he always had, but it wasn’t something he was passionate about. In fact, there weren’t many things Mark was happy doing. His speech was usually deadpan and he always had this look like he was tolerating his own existence. His family chalked it up to teenage angst. In truth, though, Mark was just horribly apathetic about life. Even being best friends with the soon-to-be most popular girl at school, Lily Ashton, didn’t phase him. She was very energetic and she spoke really fast. Everything was exciting to her. Mark didn’t get it. He didn’t really care about any of the stuff she did. It all seemed pretty useless. He didn’t say that, of course… but sometimes, he wanted to. She was always dragging him places. She’d latch on to him and off he’d go. She was strong for a girl. If she noticed his disinterest, she didn’t seem to care. When Philip wasn’t busy with the horses, he was trying to convince Gwendolyn to forgo her long ride home and stay there. Gwendolyn had been a foster child and now that she was out of the system, she had to move into a housing development. She refused any offer to stay with the McMasters, though, and she certainly wasn’t staying over! Still, Philip wished she lived closer so he could see her more than just once or twice a week. Both the Ryder and the McMaster family loved going to the public pool. It was a good way to cool off on a hot day. Mark, as usual, was indifferent about the whole experience, but Lily always pushed or drug him into the pool anyway. She was dedicated to getting him to enjoy something, that was for sure. The girl was unflappable. The pool was pretty cool, but the best part was the slide as far as the smaller kids were concerned. They were forced to take turns after Jessica and Juliet tried to double-up and nearly slid into the pool itself. Noreen was still working on her Children’s books. She had several hits and a best-seller under her belt, which fueled her fire for writing. She had started out by writing about Philip, but now that he was older, she turned to the smaller kids and their experiences. Juliet had shown some interest, while Catherine all but ignored it in favor of the television. Philip was overjoyed when his garden finally took off. He’d taken classes and read all kinds of books. He hoped to eventually have a huge garden, but that would have to wait. 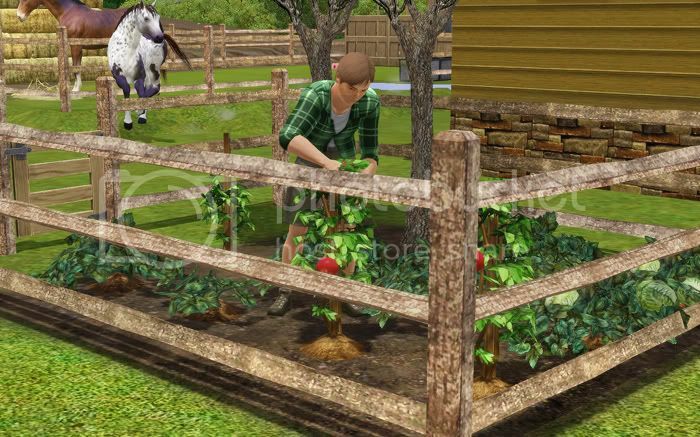 He had problems, initially, with the horses eating his plants, so he had to fence it in. It was small, but someday, it would be huge and amazing. Philip had a natural talent with growing things. Of course, all of that fell by the wayside once Luis called him to tell him he was back. He’d been away for several months at the Academy for training. 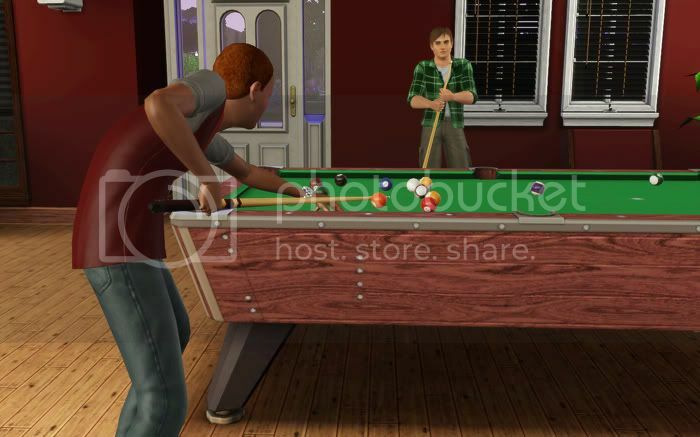 They met up at the local hangout to play some pool. Novak 2 – Stefan and Paula. This name is taken from Camilla since her household is now ‘Klein’, but keeps its spot in the rotation. I hate that I won’t get to the other YAs until the end of the round, lol. Poor Mark is really apathetic. 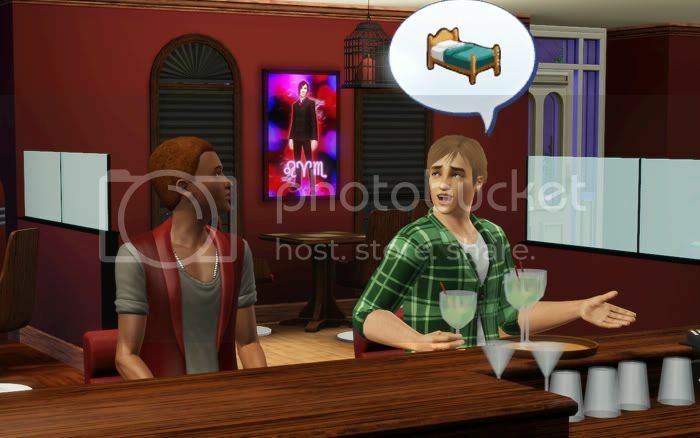 His sim just sort of floats around and never really makes any sort of happy faces or anything. 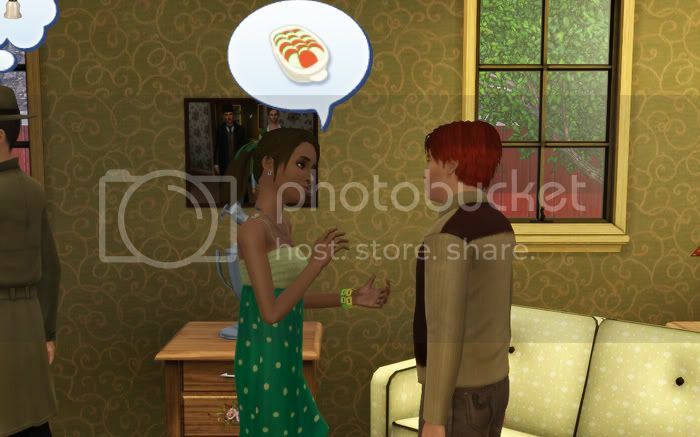 He got Hopeless Romantic as his teen trait, but I don’t see that kicking in quite yet. 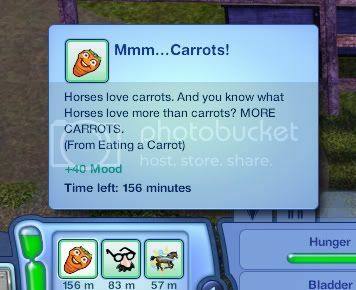 Horses REALLY love carrots. They’re like horse crack. It’s hilarious. They kept eating poor Philip’s carrot plants! 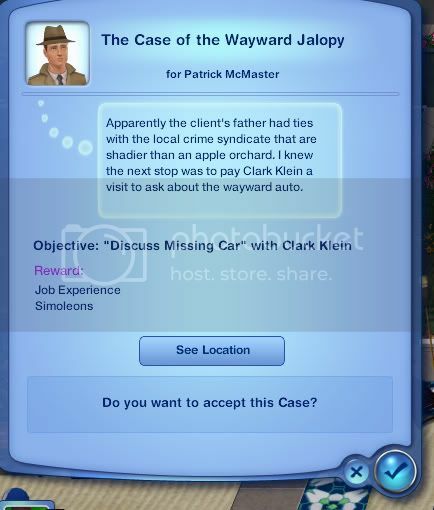 Even the game knows Clark is into some sinister stuff! Too funny. The client was Camilla, which I also found pretty hilarious. I’ll finish this by saying how stunned I am that Philip took so much after his father, Patrick. I thought he looked more like Noreen, but once he switched to YA and I went to make him over, I was like, “whoa, he looks like Patrick!” He’s bulkier though, which he got from Noreen. It’s mostly muscle, which fits with his lifestyle. Ha, Josh! I can’t wait to see what their babies turn out like… provided they don’t go the way my other couples have lately. I don’t think they will. You and Mark are kindred spirits! I need to kick him out of it. He makes me sad. Geez, blissed out for 156 minutes for eating one carrot?! That’s nuts! Oh well…easy to keep them happy, I guess! 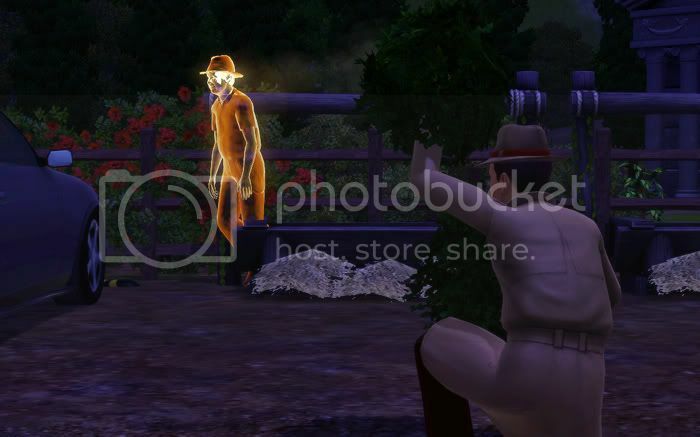 I think that happy carrot might be the cutest/creepiest thing since the woohoo heart. I really love how the game seems to know what you’re doing with Clark. I mean, I know it’s quite random but it’s hard to believe that sometimes. 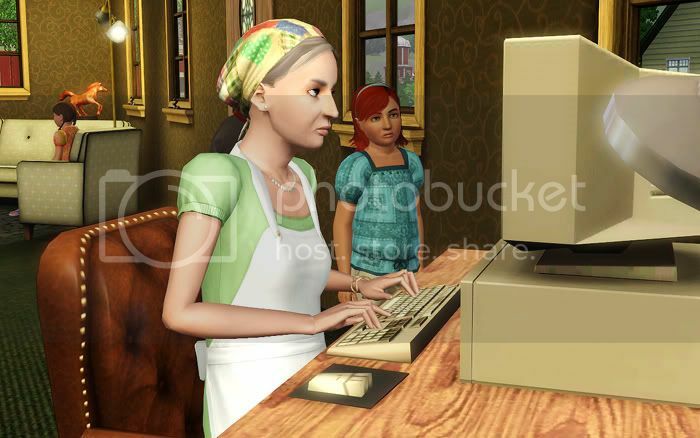 I hope Luis is as trustworthy as Philip thinks he is, if Gwendolyn is living with him now. Or maybe I should be worried about Gwen. Or maybe they’ll both behave themselves, who knows? Stranger things have happened! Mark is just your typical sullen teen, it seems. Maybe he’ll perk up a little once he gets a little more interested in his Hopeless Romantic side. I KNOW! The carrot thing cracked me up, especially because it was obtained by eating up poor Philip’s garden! Don’t get between horses and carrots. Luis is pretty trustworthy, I can’t see him doing anything creepy. 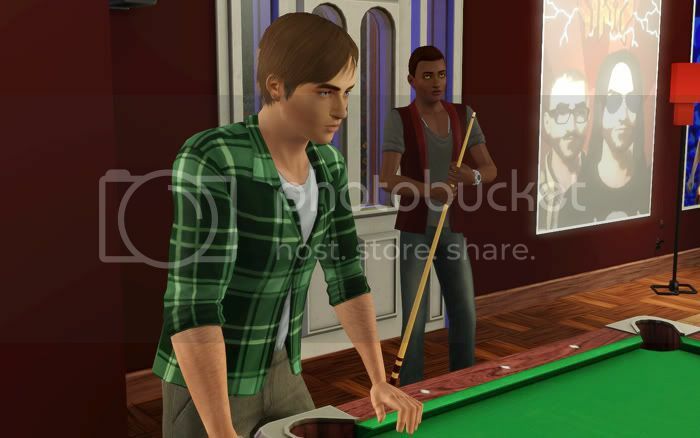 He and Gwendolyn have been around one another a lot since she started dating Philip. I am just hoping that MY estimations of them are the same as the game’s. I am hoping. He is so depressing! I seriously LOL’d at that freaking carrot! If only it were that east for humans! Phillip and Gwen are super cute, and how virtuous is she? So adorable! I think that staying with Luis is pretty safe for her. I can see why she wouldn’t stay with Phillip. He’s pretty persuasive. 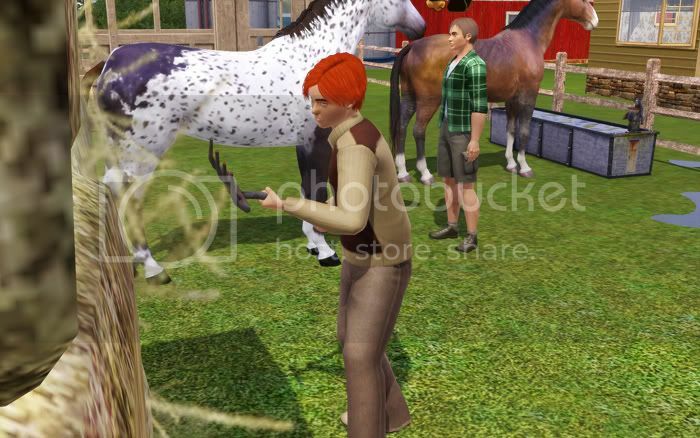 He looks good taking care of the horses too! Really enjoying Patrick’s case! So much at play here! I wonder what he wanted to find in the graveyard! Oh, Gwen. This just makes me sad. I can’t say why, but it does.